Dec. 6, 2015 -- A championship has come to the Rose City. The Portland Timbers scored two goals in the first eight minutes, then fought off a pesky Columbus Crew FC team to capture the MLS Cup in their fifth year in MLS action. Portland bested Columbus in the match, 2-1. The match was hosted by Columbus and televised on ESPN. Diego Valeri slid under Crew goalkeeper Steve Clark, who misjudged the ball, to kick it into the left side of the goal just 27 seconds into the match to put Portland up 1-0. It was the earliest goal scored in MLS Cup match history. Seven minutes later, the Timbers went up 2-0 on Rodney Wallace's header on the assist from Lucas Melano, who passed left on an aggressive offensive break. There was speculation that the play began as the ball appeared to some as to go out of bounds. The Timbers' Diego Chara played the pass from Darlington Nagbe, setting up Melano on the break. When Kei Kamara scored off the cross from Juston Meram, which nearly seemed like a circus play, in the 17th minute, it seemed as though fans might be in for an offensive shootout. However, no more goals would be scored though the next 72 minutes plus a combined 6 minutes of extra time of the first and second halves. Much was made during the match, especially by ESPN analyst Taylor Twellman repeatedly during the match about the ball being out of bounds before Chara's save leading to Wallace's goal. In the second half, Michael Parkhurst stopped a corner kick by the Timbers, which bounded around the goal and hit his arm, but the hand ball penalty was not called. Essentially, the two calls balance out one another. Valeri was named Player of the Match. The Timbers had 12 shots on goal, including 8 on target, while the Crew managed 9 and 1, respectively. Over 2,000 members of the Timbers Army, including mascot/log cutter Timbers Joey, made it to Columbus for the championship match. Leading up to the match, "Rules" signs around MAPFRE Stadium were altered to include "No Chainsaws Allowed." Attendance was listed at 21,747. 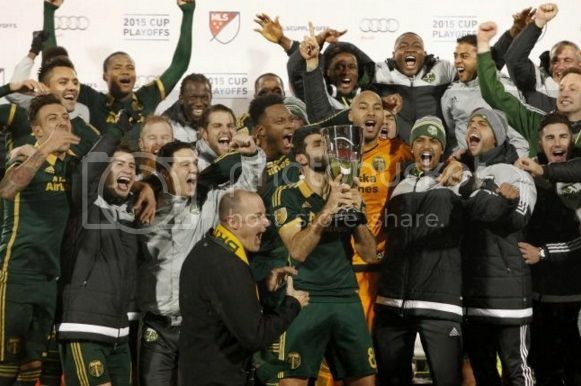 Upon being presented the championship trophy, Timbers owner Merritt Paulson simply held it up with both hands, smiled big, then handed the __ trophy to his team. At this writing, there have been calls for the city of Portland to give the team a parade, but nothing has been set. We will keep upi updated as to whether -- and when -- a parade may take place. Portland has a new championship! Way to go Timbers! I watched most of this match. It was really hard fought. The better team won. I bet Portland is very proud. I'm late, but congratulations to the Timbers! What a great season!